I've been doing some work on the way I display our history of pictures on this blog. I have a tab at the top called "Our Photo Albums." That used to be an external link that took you to a page where you could see ALL of our public photo albums using Picasa Web Albums. With the retirement of Picasa Web Albums (if you don't know about that, here's my article on it), it is unclear if that technique is still going to work. Any individual pictures showing in the blog will not be affected by the retirement. All pictures I've uploaded over the years to Picasa Web Albums are now visible using Google Photos, and Google assures us that the link that make those pictures show up in blog posts will continue to work just fine. But, the full page of ALL public web albums is a feature that they have decided not to continue in Google Photos. They may change their minds - things are always changing at Google - but for now there is no Google Photos link to all public albums. You can get a link to an individual album though, so I have created a page for this blog where I will post those. To make it look pretty, I take a screen capture (using the Snipping Tool in Windows) of the Album cover. I post that graphic on the blog page, then link it to the Google Photos album. I will do this each month, adding the current month's album to the top of the page. Check it out, click the "Our Photo Albums" tab at the top of this page. You should see a February album that you can click to see the whole album, a January album, and then a link to all albums before 2016 - using the PWA link to all public albums. I'm trying to get information from Google as to whether that will continue to work. 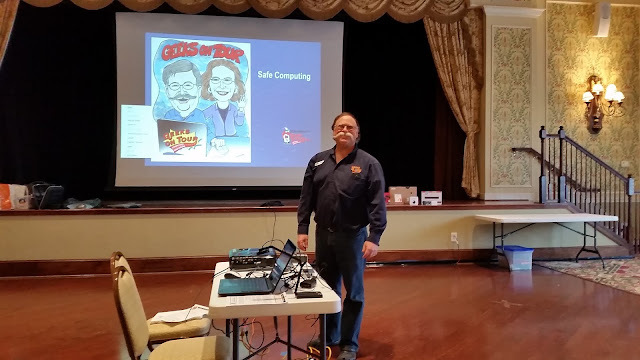 This has been a busy month of giving seminars - mostly to Computer Clubs. We are on a speaker's bureau of sorts. The Association of Personal Computer User Groups, and more specifically, the Florida Association of Computer User Groups have a variety of clubs. Some of them are independent clubs that have been around for a long time - like the Boca Raton Computer Society. I actually remember visiting the Boca Raton club back in the 80s - I probably spoke on using WordPerfect! That was my specialty back then. This month we were there and spoke on Smartphones and Tablets! Other clubs are organized by groups who live in a particular retirement community, like Valencia Falls Computer and Technology Club. This is where Sam Wexler presides and he has taken it upon himself to let the other clubs know about us via an email blast. That is how we got booked for 6 presentations in February. Then we also presented at RV parks for 4 more seminars. Add to that our Sunday online shows, and we presented 14 seminars this month from the west coast of Florida to the east, and even one remote presentation in California. Geek Week at Riverside RV Resort. Check out our new floor-stand banners! Our most popular topics this month were Smartphone Basics and Google Photos, but it's changing all the time. We spend most of our time learning! We are constantly revising our list seminar topics. Work Across the State and Across the Country, in One Day! What a day last Tuesday was! 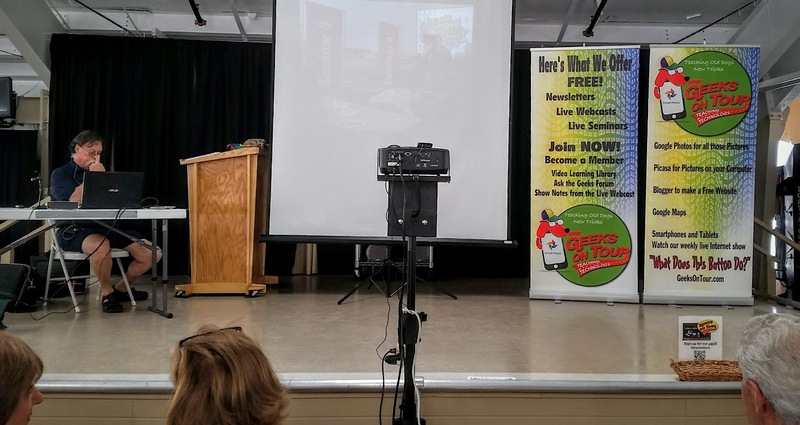 We gave two seminars: one at 10am and one at 10pm; the first one in Sarasota, Florida and the second in Laguna Woods, California! 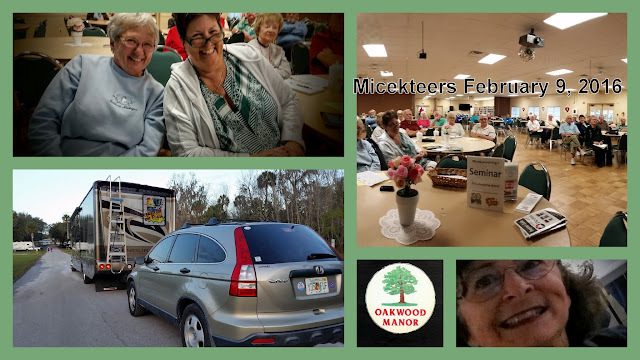 We were staying at the Thousand Trails, Peace River and had to get up and be on the road by 8 in order to get to Sarasota to deliver a 10am presentation to the MiceKTeers computer club. I hate to leave any place that early - but I always hate to leave the beautiful Peace River. Had a good group for our Google Photos / Picasa Seminar for the MiceKTeers Computer Club in Sarasota. Sarasota is on the west coast of Florida. 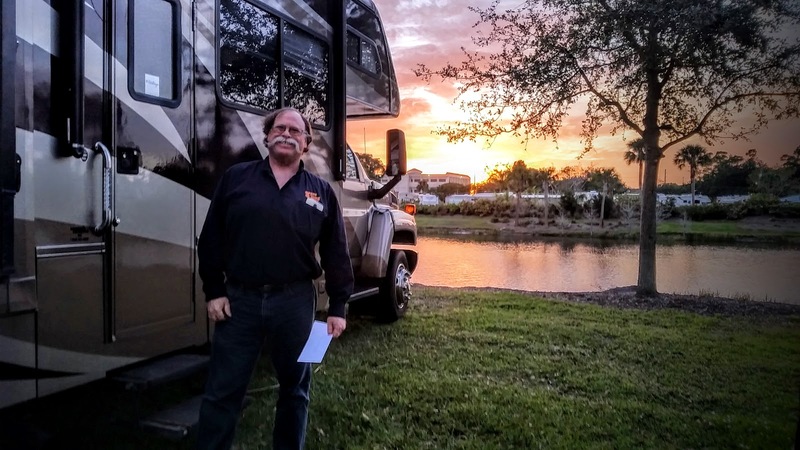 On Wednesday we're booked at a computer club in Port St. Lucie which is on the East Coast of Florida, so, after the Sarasota gig, we got back in the RV and drove across the state. 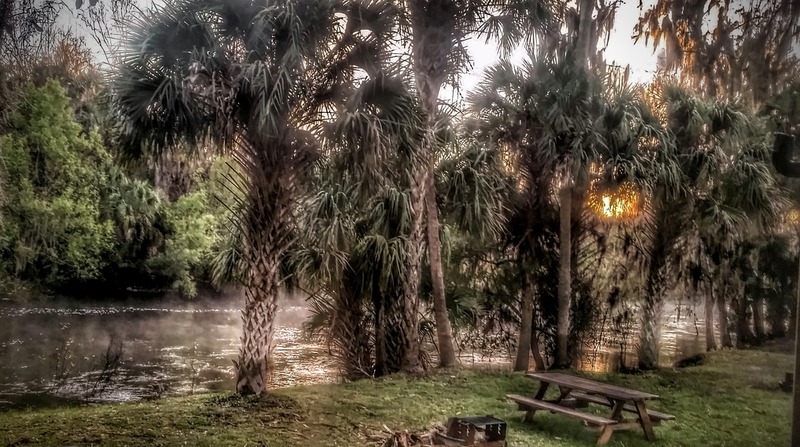 This time of year in Florida, you need reservations if you expect to get a site at an RV park, and we didn't even try. We found an Elks Lodge in Port St. Lucie who said, sure! We have room in the field out back. No hookups, but it was a nice field overlooking a pond and it had GREAT Internet service from a Verizon tower right next door. 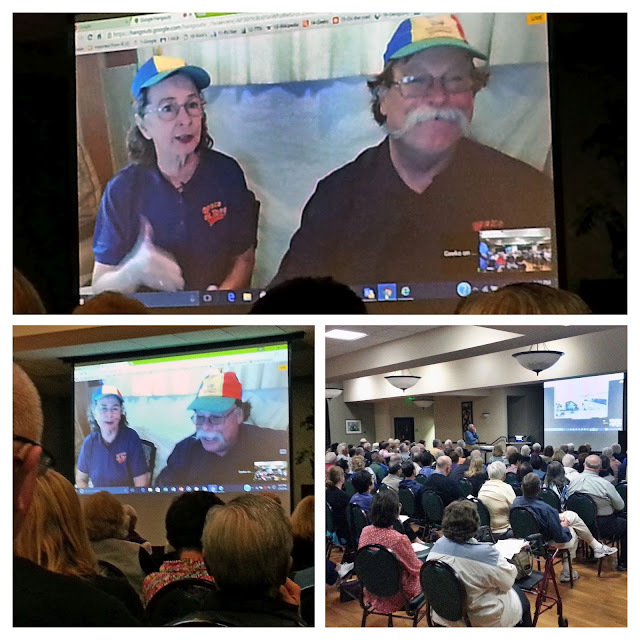 That was important because we were booked to give another Google Photos presentation on Tuesday night ... in California! We used Google Hangouts On Air to deliver the seminar remotely and, it went great. Their meeting was at 7pm - Pacific Time, which meant 10pm our time. Whew! What a Day! Because we used Google Hangouts On Air, the whole seminar was recorded on Youtube. It's a good thing we love what we do! And do we ever!